jeffstaple has teamed up with PUMA for another iteration of the Staple Pigeon PUMA Suede — the sequel to the 2013 “Pigeon” Suede and 2016 Staple x PUMA pack. 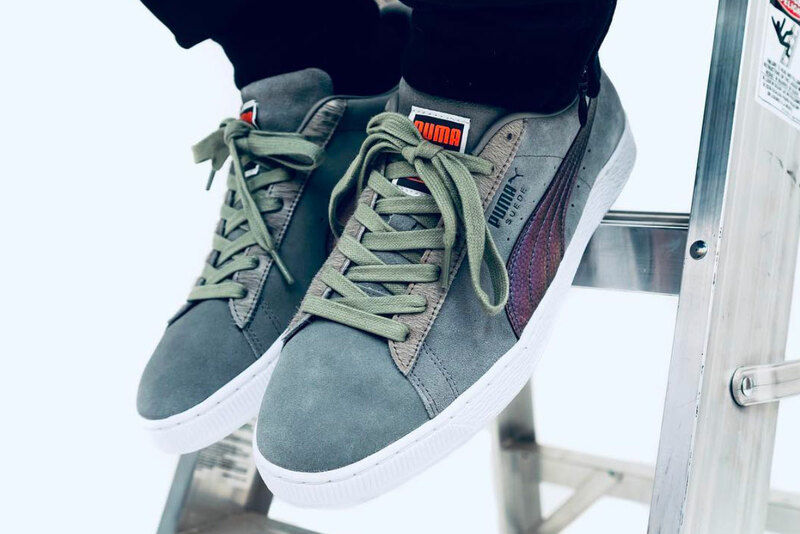 The 2018 PUMA Suede “Pigeon” features a grey nubuck leather upper with an iridescent purple branding stripe, mimicking the city bird’s feather coat. A grey furry material appears on the lace trim and heel counter, which has an orange embossed PUMA logo on one foot and a pigeon silhouette on the other. Finally, a co-branded graphic of the PUMA mascot with the Staple Pigeon appears on the shoe’s tongue tab and the shoe box, completing the special edition collaboration. The remastered jeffstaple x PUMA Suede “Pigeon” launches on the night of October 30 at Extra Butter in NYC with an online release on October 31, 12:00 a.m. EST at staplepigeon.com. A larger drop via select PUMA retailers worldwide is slated for November 8. In other sneaker news, a new Travis Scott x Air Jordan 1 collaboration might be in the works. From the Golden Cabane creatives. And a release date may have leaked.